The pictures below are of an application completed at our Langley, BC facility. This involved lining a steel pipe with an internal diameter of 24″ inches and is a job we’ve done several times before. It’s innovative work and we wanted to share some details and pictures in case the application might be of interest to other companies. 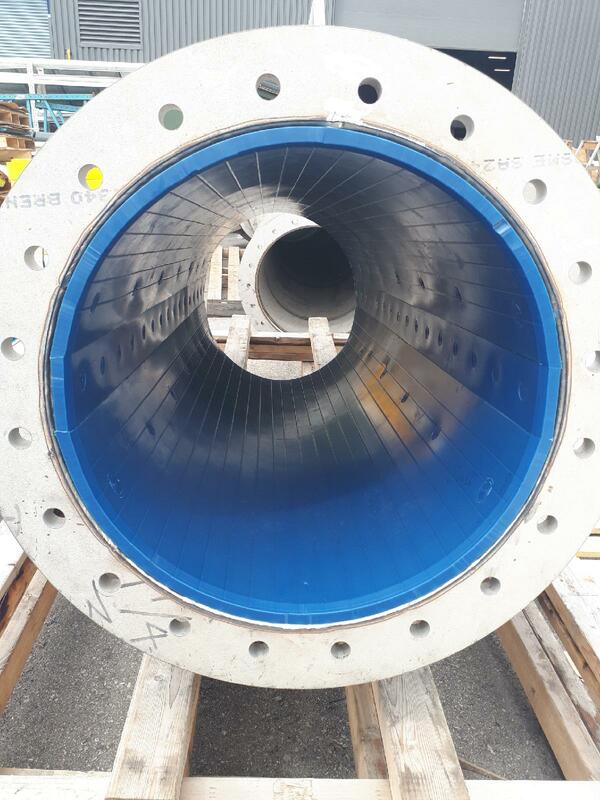 The customer ships their pipe segments to our facility where the lining is done on site. 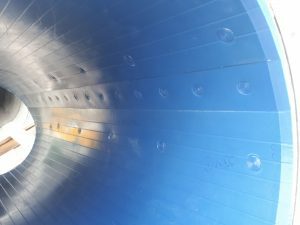 We have fabricated 3/4″ thick Tivar 88 sheet that comes pre-scored to permit bending. This is important since Tivar 88 is not available in pipe format, so the solution must be made from sheet stock. As you can see in the second picture there are not too many fixation points. There is a middle strip of plastic serves as a wedge, and the pressure alone holds the lining solution in place (though the strips on either side of the wedge also have fixation hardware, to help secure the wedge). Tivar 88 is a premium grade of UHMW polyethylene and its blue color is readily identifiable. It provides additional strength and slickness that virgin or reprocessed grades of UHMW do not. Tivar 88’s primary benefit is increased material flow and less material hangups. Secondarily, Tivar 88 provides a wear surface that protects the steel from wearing out. For assistance with your application please contact us.